HIMALAYAN glaciers are the sustaining force for major river basins in northern India. Important rivers like the Ganga, Brahmaputra and the Indus depend on water released from these glaciers for their flow. Ever since the Intergovernmental Panel on Climate Change erroneously claimed in a 2007 report that most Himalayan glaciers will melt away by 2035, environmental scientists have been trying to correctly understand the expected warming-fuelled melting pattern of these glaciers. Now researchers from the Netherlands have produced evidence that despite Himalayan glacial recession, melt runoff will keep increasing until 2050. Combined with a projected increase in rainfall, water availability in major rivers like the Ganga and the Indus will continue to remain good in this century, shows their study. What happens after 2100 is too uncertain to make statements about, say the researchers. The findings were published in Nature Geology on August 4. For their analysis, the team studied two Himalayan glaciers: Baltoro in Pakistan administered Baltistan and Langtang in Nepal. Baltoro glacier feeds the Indus, whereas Langtang feeds the Ganga. One of the authors, M F P Bierkens, who is the chair of earth surface hydrology group at the department of physical geography of Utrecht University in the Netherlands, says they reached the conclusion by using computer based climate and water models. “Climate models consist of mathematical equations describing air movement, temperature and amount of moisture. Through these equations, one is able to project how temperature and precipitation will change for all locations on earth as a result of increasing levels of CO2 in the atmosphere,” says Bierkens. The researchers applied the temperature and precipitation projections into computer models describing glacial size and water flow in Himalayan catchments. “This enabled us to project how the size of glaciers will change under a changing climate and what will happen to the river flow originating in these areas,” adds Bierkens. 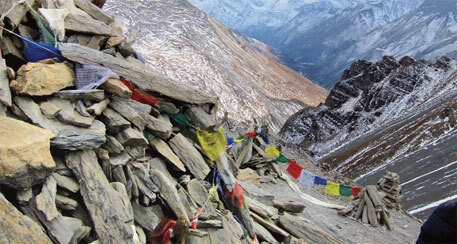 Over 9,500 Himalayan glaciers drain into the Indus and the Ganga. This makes one wonder how a change in melting pattern of so many glaciers would impact the river flow in coming years. “As the catchment we investigated is exemplary of other catchments in the upstream Ganga, we expect to see similar trends in the other catchments and their glaciers,” says Bierkens.